Best Cast Iron Dutch Oven: How To Find It For Your Cooking Needs? 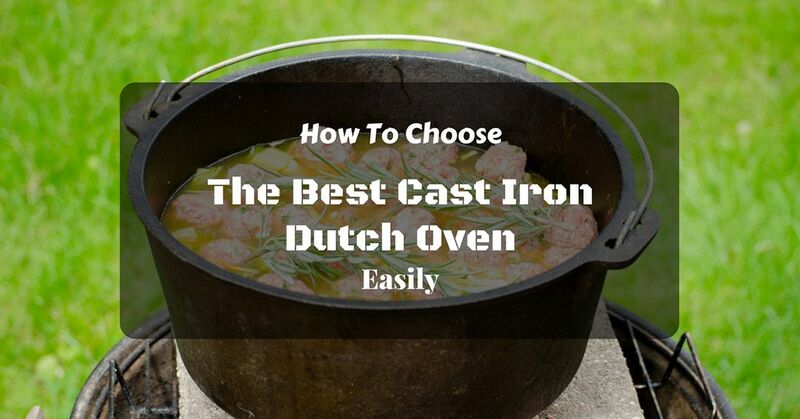 →How To Choose The Best Cast Iron Dutch Oven Easily? How To Choose The Best Cast Iron Dutch Oven Easily? This is the first factor that you should consider when purchasing a Dutch oven. It should have heavy sides and a heavy bottom. This will ensure that the pot holds enough heat as desired. A heavy pot means that the heat will be distributed evenly leading to better cooking results. The lid of the should be able to fit properly. It should not leave gaps or any sliding. Some of the lids have handles on the sides or a knob at the top. All these are good but a metal handle on the lid is more durable. The plastic handles cannot be used in the oven. This is a potential issue that should be considered. Most of the pots have bucket-style handles. These are not good for kitchen use, especially in the oven. They can be used on camp stoves and campfires comfortably. Choose pots with handles that are sturdy and compact. They should be gripped easily. They should provide secure holding for the heavy pot. This is an important factor that you should consider before you buy your Dutch oven. This depends on your choice. A standard pot has a capacity of 5-7 quarts. This works well for most cooks. Consider the number of people you will be cooking for before you buy the pot. Most of the Dutch ovens are oval or round. If you are unable to decide the size of the pot, the oval-shaped pot is better. 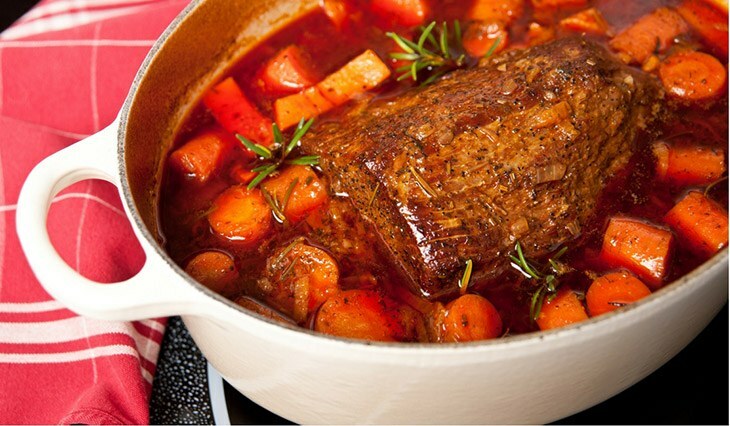 If you love roasts that are oblong generally, the oval pot will accommodate the large roasts comfortably. A round pot should be big enough to accommodate your roasts. Ensure that you don’t compromise the cost or the size of the Dutch oven. A decent pot will last longer. Get what you want because you will be using the pot for a long time. The pot is made of cast iron. It has a capacity of four quarts. It is used for fireplace cooking or campfire. The pot is seasoned and ready to be used. The lid can also be used as a griddle when it is inverted. It has a 10-inch diameter and 3.5-inch deep. This will provide you with a superior performance in your cooking. The oven is designed to meet your demands in the kitchen. It is good for preparing desserts, braises, soups, and other specialized recipes. The pot is multifunctional. It can be used for slow cooking perfectly. Heat is distributed evenly through the side walls. It is made of cast iron that is good in distributing the heat evenly from the base through the walls. The heat is retained to ensure that your meal remains warm for some time. ​The pot looks well in most kitchens. It is also an excellent source of nutritional iron. ​The loop handles ensure that the pot is handled carefully. ​It is easy and simple to clean and use the Dutch oven. ​The pot is virtually nonstick. This ensures that your food does not stick. It has legs that allow the Dutch oven to stand over the hot coals easily. ​The oven can be used over the campfire or the hearth. This is because it has a heavy gauge wire bale. ​The lid can be inverted to be used as a griddle. It also perfectly fits the pot, this makes it easier to be used for stewing, baking, and roasting. The pot can be used for sautéing, braising, roasting, baking, frying, searing, and simmering. ​The cast iron can be used with various cooktops including the induction cooktop. It can also be used on open fire, g﻿﻿rill﻿﻿s, and on the campfire. ​The pot is seasoned for a natural and easy release finish that becomes better and better after every use. ​The oil that is used for baking helps to prevent rusting and it will eventually provide a nonstick surface. The oven may crack if it is not handled appropriately. The pot is small to cook for a small number of people. You will have to buy a large pot if you will be cooking for more people. The pot is well known for cooking delicious meals. You can cook slow roasted meats and also the fruit cobbler. The lid of the pot can double as a ﻿skillet. You can turn it over to cook bacon, eggs, or pancakes. It has a seasoned finish. The lid has an effective and convenient loop handle. It also has legs which can help you to use it as a griddle or skillet. You can cook food for about 16 people. This is because of its large capacity of 11 7/8 quarts. The pot has a built-in thermometer notch. It has a capacity of 11 7/8 quarts. The lid of the pot can be used as a skillet or a griddle. It has legs which make it sturdy. ​It can be used to cook for a large number of people. This is because it has a large capacity. ​It has a built-in thermometer notch. ​It comes with a lid lifter. The lid can be lifted easily because it has a loop handle. It has a seasoned finish. The pot is manufactured in china. If high heat is used to preheat the pot, the food may stick or burn. This is an enameled cast iron oven. It has a diameter of 23 cm and a height of 10 cm. It is designed to last for several years. It is resistant to high temperatures of up to 500 degrees F. It is good for braising and cooking other foods that require more time to cook over low heat. It can be used to cook and as a serving dish. The pot can help to increase the iron content by 20%. This is a dependable cookware in any kitchen. It does not leach any chemicals when cooking. Before you clean the pot, ensure that it has cooled completely. You can use hot water that is soapy with a sponge to clean the pot. The Dutch oven has a skillet cover that will bring luxury to your kitchen. It is used to cook vegetables, paninis, and steaks perfectly. ​It has an ample cooking space and you can use it over the campfire or in the oven. ​It can be cleaned easily with hot soapy water. The cast iron Dutch oven is lead-free. The pot requires seasoning before you use it by rubbing oil and baking them for about 2 hours. It may develop cracks and chips. You need to preheat the pot with oil always before you cook. The pot has large and ergonomic handles that help you to grip. It distributes the heat evenly and retains it. The interior is sand colored and it is resistant to wear. The exterior of the pot has the ability to resist cracking and chipping. The large knob can withstand high temperatures of up to 500 degrees F. The cooking process is enhanced by this Dutch oven. More moisture is locked in and the heat is distributed evenly. The enamel is resistant to cracking, chipping, dulling, and stains. The pot is beautifully designed to match with most modern kitchens. ​The interior is sand colored which makes it easier to monitor your food as it cooks. This prevents the food from sticking or burning. ​The knobs are ergonomic and resistant to heat up to 500 degrees F.
It is easy and simple to use this pot. It is designed with versatility. ​It can be used on all cooktops including the induction cooktop. It can perfectly fit any dining or kitchen décor. ​It can be used in any cooking and food preparations. You can use it for stir-frying, searing, baking, or slow-cooking. 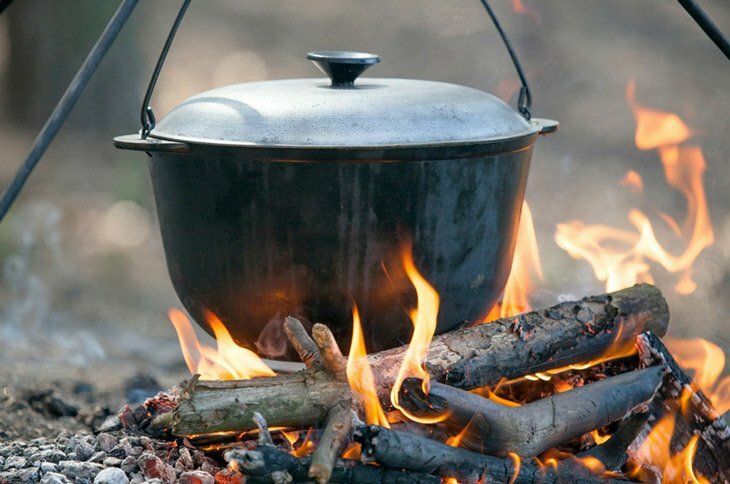 ​This Dutch oven can be used as a serving dish and also keep the warm for some time. You can also use the oven to keep your food cold. You can also place it in the freezer to store food. ​The surface is impermeable, this makes it ideal for marinating food with acidic ingredients and storing cooked or raw. You should not use high temperatures to preheat the pot. Overheating will make the food to burn or stick. This is because the cast iron can retain heat efficiently. The oven may develop cracks and stains. The pot has a capacity of 7 quarts. It is oval in shape and it is designed with the best materials to make it of high quality and value. It retains and distributes the heat evenly. This ensures that you achieve the best results. The lid has self-basting condensation on the ridges that collect and direct the moisture into the food. This ensures that the food is nutritious and flavorful. You can use the oven to prepare the best cobblers, baked desserts, and bread. The handles on the sides are secure and sturdy to lift when transferring the pot to the table. The surface is coated with smooth, off-white, and easy to clean porcelain enamel that is PTEF and PFOA-free. You cook with this pot and use it as a serving dish on the table. It is easy to clean the oven. you only need to hand-wash it. It can be used on any cooktop including the induction cooktop. ​It is resistant to high temperatures up to 450 degrees F. This makes it oven-safe. ​It has a lifetime warranty. This enameled cast iron oven distributes the heat evenly and can retain the heat. ​The stainless-steel knob is oven safe and durable. The interior cooking surface does not react with the food and it is easy to clean. ​The lid has the self-basting ridges that collect and direct the moisture back to the food. This will give you savory and moist dishes. The enamel is prone to cracks and chips. 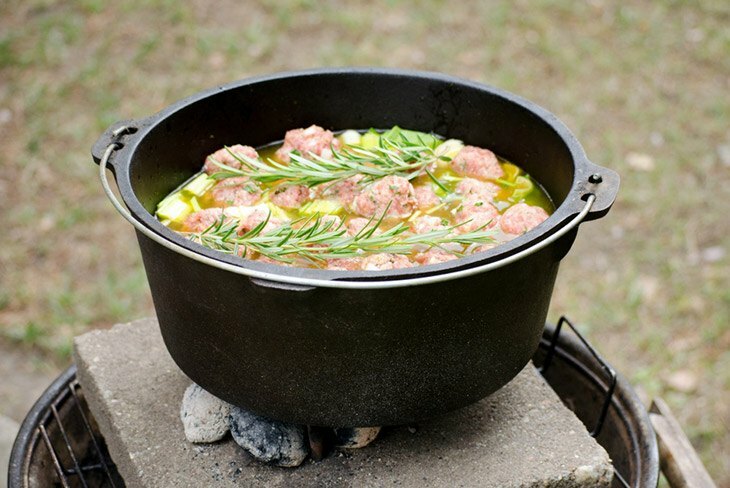 Among the above cast iron Dutch ovens, the lodge cast iron camp Dutch oven stands out. It is easy and simple to use. This will provide you with a superior performance in your cooking. It is designed to meet your demands in the kitchen. The loop handles ensure that the pot is handled carefully. It is good for preparing desserts, braises, soups, and other specialized recipes. The lid can be inverted to be used as a griddle. It also perfectly fits the pot, this makes it easier to be used for stewing, baking, and roasting. The cast iron can be used with various cooktops including the induction cooktop. It can also be used on open fire, grills, and on the campfire. The pot is seasoned for a natural and easy-release finish that becomes better and better after every use. The oil that is used for baking helps to prevent rusting and it will eventually provide a nonstick surface. You can also see the best stock pot on the market. How To Choose The Best Chinese Cleaver On The Market? How To Choose The Best Cappuccino Maker For Your Kitchen? How To Choose The Best Whistling Tea Kettle For Your Beverages? How To Choose The Best Cake Pans For Your Cakes? How To Bake A Cake At Home Perfectly? How To Cook Ribs In The Oven Easily? My name is Jennifer Brown. Do you want to know more about the foods you can prepare in certain occasion? I provide step-by-step instructions in my recipes, plus high quality photos of those recipes! Imaddictedtocooking.com is a participant in the Amazon Services LLC Associates Program, an affiliate advertising program designed to provide a means for sites to earn advertising fees by advertising and linking to Amazon.com. Additionally, Imaddictedtocooking.com participates in various other affiliate programs, and we sometimes get a commission through purchases made through our links.